Chocolate is an important part of life, is it not? It's smooth, delicious, and oh-so-lovable. Unfortunately, the reality of life is that our love of chocolate is evidenced by the stains on our laundry. With a few simple steps, you can remove even the most stubborn chocolate stains. Remove excess chocolate. Use a butter knife or a spoon to remove any bits of chocolate from the fabric. You don't want to use anything sharp that could cut or damage the fabric. 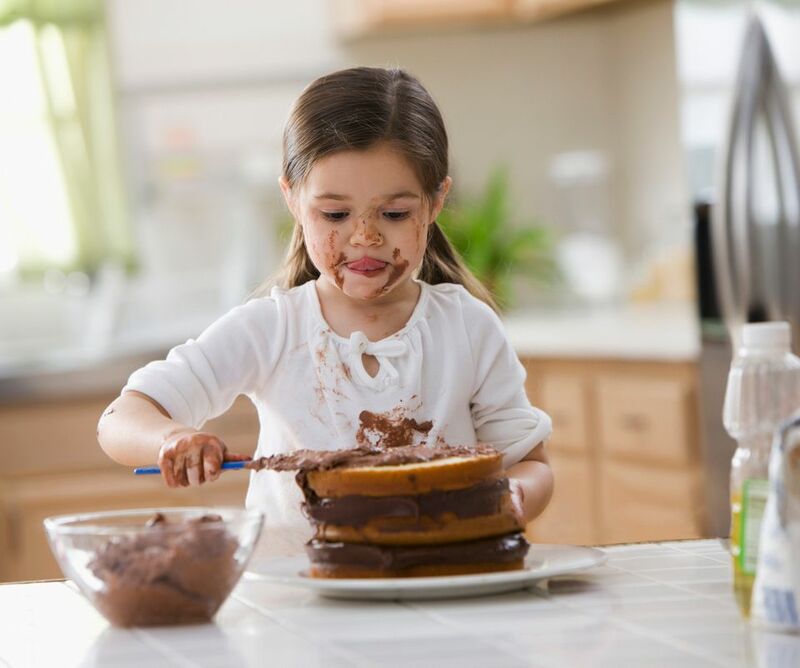 Work carefully to make sure you don't spread the chocolate to clean parts of the clothing. If the chocolate has already dried and hardened onto the fabric, it can be tricky to peel away without damaging the fibers of the fabric. Use your best judgment, but if it seems like it is doing more harm than good, do not peel or scrape away dried chocolate. Rinse with cold water. Using cold water, rinse the back of the stained area. This allows the stain to travel back through the least amount of fabric possible. It's tempting to use hot or warm water, but this will actually set the protein-based part of the stain. Chocolate also has an oil-based stain component, so using cold water may seem counter-productive, but you are just trying to remove as much of the stain as possible without setting it permanently. Rub in some liquid laundry detergent. Gently rub liquid detergent into the chocolate stain. If you don't have or use liquid laundry detergent, you can substitute a liquid dish soap but don't use detergent meant for the dishwasher. Laundry soap or dish soap will help to break down the stain in the fibers. Allow the clothing to sit for 5 minutes. Do not rinse. Next, soak the clothing for 15 minutes in cold water. Every 3 to 5 minutes, rub the stained area between your fingers and thumb gently to loosen the stain. Rinse thoroughly. Continue until no more stain can be removed. Rinse the stained area completely. Try a stain remover. If an oily stain remains, add a stain remover gel or spray. Treat both sides of the stain so that it penetrates fully. Wash clothing normally in the washing machine. Before drying, check to make sure the stain is completely gone. Air dry at first to make sure no hint of the stain remains. Repeat the steps if the stain is still present. Older chocolate stains may show up as a dark blotch on fabric that can't be removed. Since chocolate stains set with heat and time, these can be difficult to remove. Your best bet is to rub liquid laundry detergent or dish soap on the stained area and soak the clothing in a bowl of cold water for at least 30 minutes. Repeat this step until you aren't seeing any improvement. Wash the clothing with a color safe non-chlorine bleach like OxiClean. If the stained area of the clothing is white, you can try treating with a Clorox Bleach Pen or with a mild bleaching agent like lemon juice. Be aware that these items will damage the color of anything they come into contact with, so use caution. Rinse completely. Wash normally and check to make sure the stain is fully removed.